DUG Insight User ManualFrequently Asked QuestionsFrequently Asked Questions Volumes and DataHow do I gain a volume between two horizons, using a spatially varying multiplier? In this workflow, we apply a gain to the values of a volume between two horizons. The amount of gain applied is defined by a third horizon. 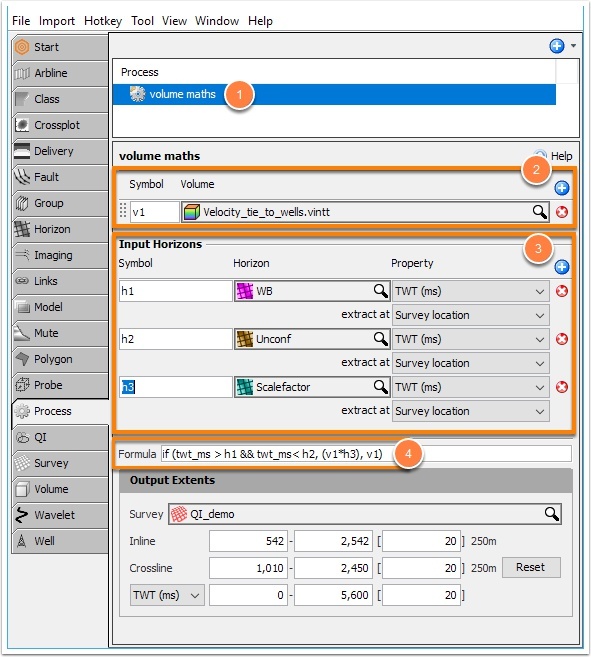 Create a Volume Maths process. Click the Volume (+) and select the volume to scale. Use the default variable name, “v1”. This example uses a volume called “Velocity_tie_to_wells”. h1: choose the upper-bound horizon. h2: choose the lower-bound horizon. h3: choose the is the horizon (grid) based scale factor. The result of this process is a new volume, located in the Volume tab. Note: Use the CTRL-P hotkey to quickly switch between a process and its result volume. Go to View > New IL/CL View or 3D View to QC the result. Prev: How do I merge lines from multiple 2D volumes and surveys into a single volume and survey?